You win some and you lose some. A couple of businesses in San Jose, neighbors on The Alameda, have found themselves on opposite sides of Fortune’s wheel. Greenlee’s Bakery happily is on the ascent, whereas Andy’s Pet Shop has sadly sunk beneath the horizon, never to shine on The Alameda again. Technically it’s not Greenlee’s Bakery per se which is enjoying good fortune, but rather its flagship product, Greenlee’s Best Cinnamon Bread. Its popularity has increased tenfold in recent years and continues to grow and with good reason: it’s fantastic. Christmas Eve, 2009, I was driving around town looking for gifts for family. Don’t judge; that’s how I roll. I was headed to a bookstore to pick up some goodies when I pulled up behind a Greenlee’s delivery truck at a red light. It was as if the heavens opened up and The Voice proclaimed, “Get thee to Whole Foods.” So I gat, and I got loaves of cinnamon bread for everybody, and they loved it. The first thing you notice when you pick it up is how heavy it is. The next thing is the amazing aroma. My car smelled like an enchanted gingerbread house by the time I got home with a half-dozen loaves in the back. Open up the bag, peel off a marbled-spice slice, pop it in the toaster to caramelize the gooey glaze, slather it with something sinful, and the result is pure joy. Whole Foods Market is in fact how the bread is taking off. After catering just to locals who kept the secret well, Greenlee’s a few years ago widened their reach a smidge by branching out to farmers’ markets around the Bay Area. A Whole Foods buyer discovered the bread in Redwood City and now loaves are sold in Whole Foods stores up and down the West Coast. They’re not done; the Southwest and Midwest are next, and they’re talking about going national by the end of the year. Every loaf is still baked right at Greenlee’s Bakery at 1081 The Alameda alongside an assortment of event cakes, cookies, and muffins, though I imagine they’d have to add capacity to keep up with national demand. In stark contrast, at the end of the block Andy’s Pet Shop has sadly vacated the premises after sixty years at that location. The iconic neon sign out front has been a landmark for decades. The building used to be a California Highway Patrol office, but after Andy Camilleri and his wife Geraldine took over it became well-known for its selection of unique and exotic animals and birds. After the Camilleris died the business changed hands a few times and is now owned by Lissa Shoun and Eric Bong who changed it over completely to a rescued pet adoption center supported by pet food and supply sales. It was the noblest of endeavors but sadly business dropped off so they had to move out. The animals were placed in temporary foster homes, the inventory was put in storage, and the neon sign is coming down. The owners are hoping to find an affordable location so they can open again. Their web site has a link where you can donate via PayPal to help defray the expenses of moving and preparing a new location. 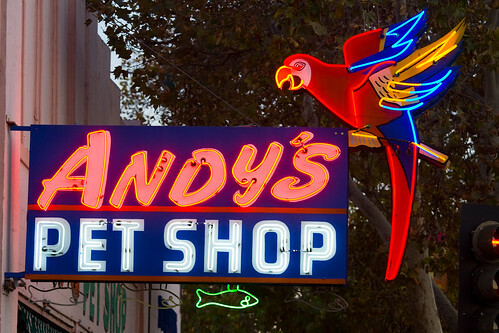 The Alameda won’t be the same without Andy’s snails and puppy dog tails, but at least we can console ourselves with sugar and spice from Greenlee’s. Did I mention you can order it online? At the Daly City BART station I wandered around looking for the Muni Route 14 stop. I looked. And looked. And looked. Then I remembered…the 14 doesn’t go to the BART station, it starts at the top-of-the-hill. Curses! I had known this from my planning the night before, but I got caught up in the romance of the trip and missed my stop. I had a good laugh at my own absent-mindedness and made the half-mile steep hike up John Daly Boulevard from the BART station back to Mission Street. Honestly though it was good to stretch my legs and get a little fresh air and exertion after four hours of sitting on buses. The Muni route description said the 14 starts at the intersection of Mission Street and San Jose Avenue, but of course when I got there I still couldn’t find the bus stop. I walked a couple blocks down San Jose Avenue. 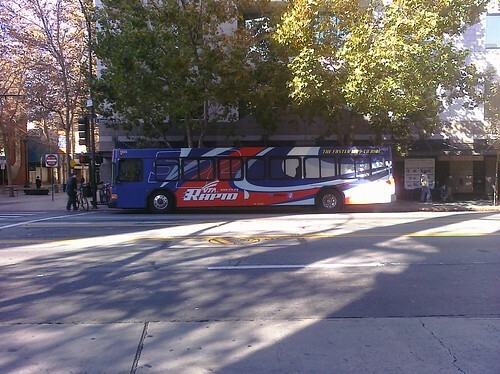 Still no stop, but suddenly I saw a 14 bus coming up San Jose towards me. I didn’t know where to catch it, but I didn’t panic. I watched it get into the turn lane to make the sharp left turn onto Mission and I realized the stop was on Mission. The bus was stopped at a long red light so I actually had time to cross the street before the bus turned. Even better, that stop was a timepoint so the driver took a break; I had plenty of time. My little bus hunt was fortuitous because it caused me to spend a few minutes on San Jose Avenue. I learned later that San Jose Avenue is the real continuation of El Camino Real to San Francisco, not Mission Street. San Jose Avenue follows the original Anza trail that became the link between Mission San Francisco and the San Jose Pueblo, and any modern map will confirm that San Jose Avenue is the more direct route to the mission via Dolores Street. Mission Street on the other hand as I understand it originally ran from the mission to the Yerba Buena pueblo on the waterfront to the north, and only after the Gold Rush extended down the county to merge with San Jose Avenue. So my misguided stroll up San Jose Avenue was in fact an unintentional acknowledgment of its rightful place in geographical history. Sadly Muni doesn’t run a bus up San Jose Avenue from Daly City to the mission, so my transit route up Mission Street was a concession to necessity. At 4:45PM the bus driver went back on duty and I boarded along with a nice little crowd that had developed in the meantime. I paid $2 and got a transfer for the return trip. 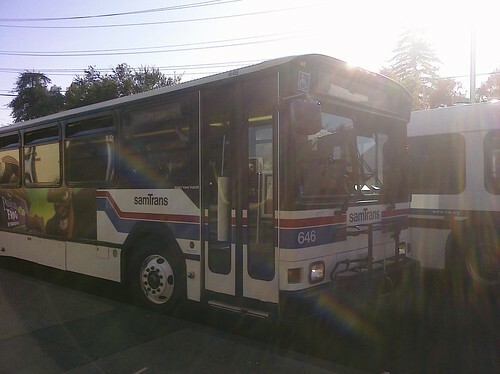 This was another articulated bus but battle-scarred and road-weary, not at all like the cushy SamTrans coach. [This just in: it has come to my attention that route 14 is actually an electric trolley, a little detail I either missed completely or simply forgot. Hey, it was a long day.] I took a window seat on the passenger side according to plan, however this time my seat faced backwards. This inbound route is a popular one so the bus filled up quickly and was soon standing-room only. As I noted earlier Daly City looks a lot like San Francisco so I had no idea where we crossed the city and county line. The city web site says the boundary is Guttenberg Street but Google Maps thinks it’s Acton Street. If Daly City and San Francisco ever go to war they can settle the issue. The ride was crowded, rocky, and increasingly getting dark so I didn’t take many notes. A cool mural near Concord Street and the old-timey Billiard Palacade did catch my attention. At 5:15 PM the bus arrived at 16th Street and I hopped off, took a moment to collect myself, and started walking west towards the Mission. On the way I considered how the rest of my day was going to go. The original plan was to leave the house early and arrive here around lunchtime, giving me time turn around and do it all again in reverse. However I got such a late start that it was now early evening and getting dark. What’s worse was I was supposed to cook dinner that evening; that clearly wasn’t going to happen. So I took out my phone and made a very difficult call to my wife, asking her to cook dinner instead. She playfully protested but after I talked her through the process of roasting the pork loin I had already purchased, she agreed. Then I made like a Palm Pre commercial and used my smartphone’s browser to look up the exact recipe from my favorite epicurean web site and email her the link, all from a San Francisco street corner. She ignored my recipe (she broiled the meat instead of roasting it) and it came out great; she was very proud of it and has since added the dish to her repertoire. These things happen for a reason. 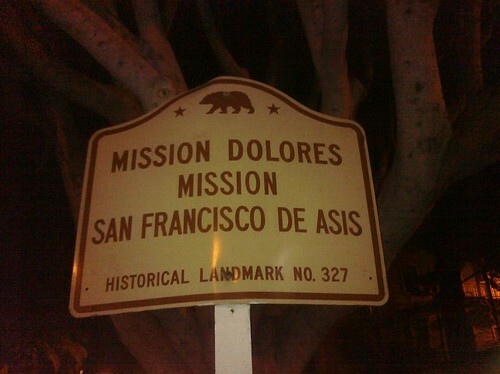 It was four-tenths of a mile down 16th Street from Mission Street to the mission at Dolores Street. I arrived there around 5:45 PM. Everything was closed for the day, dark and deserted. First I marveled at the beautifully ornate “modern” (erected in 1918) Mission Dolores Basilica. I climbed the stairs and simply touched the door to mark the end of my journey. After drinking the heady draft of the moment, I moved next door to the “Old Mission,” Misíon San Francisco de Asís. It’s the oldest surviving structure in San Francisco, miraculously surviving the 1906 earthquake and fire. It’s the sixth mission in the chain, founded by Father Palóu in June of 1776, five days prior to the adoption of the Declaration of Independence 2,500 miles away. For decades it and the nearby presidio represented the northern reach of the Spanish Empire in Alta California, the tip of El Camino Real. (The two more northern missions at San Rafael and Sonoma came much later, just as Mexico was asserting its own independence from Spain.) There’s a historic El Camino Real bell in the grassy median in front of the mission, the only bell I saw in San Francisco. Its label is gone and it’s badly rusting but like the mission, the city, and the state, it endures. I spent some minutes looking around and snapping pictures of the many historical plaques and markers adorning this special place. Finally the time arrived to turn back. I weighed my options as I walked back to Mission Street. 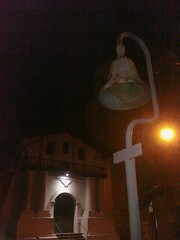 It was now too dark for effective sight-seeing so it didn’t make sense to take the slow bus ride back down El Camino. There is a BART station at 16th and Mission, which opened up some possibilities. I considered taking BART to Millbrae then transferring to Caltrain for the trip to San Jose, but with a little help from my smartphone I decided on a different route. I would take BART across the Bay and down to Fremont, catch the VTA 180 Express Bus to Milpitas, then transfer to the VTA 66 for the last leg home. Apart from being reasonably efficient, it had the added appeal of completing a big clockwise loop which is more satisfying than simply retracing my steps. Plus the East Bay part of this trip would have some special El Camino Real significance which I’ll explain in a later post; consider yourself teased. Here’s a hint: the VTA 180 goes down Mission Boulevard in Fremont. Back on 16th Street, I arrived at the BART station plaza at Mission which was sticky with inner-city character. Music blared from a boom box while dozens of people stood or sat alone or in twos or threes, living a corner life. A sincere man with a pushcart was hawking free uncooked Thanksgiving turkeys, possibly overstock from a local charity kitchen. It’s a different world from where I come from. There is a coin-op public toilet there but it was out-of-order. I was oddly relieved (pun intended) to be spared any potential unpleasantness inside, but it did mean I was in for a long evening. I took the stairs down to the underground station and fed money into the machine to buy my ticket to Fremont. I plucked the stored-value card from the machine but when I inserted the ticket into the fare gate, it was rejected. I gave it to the station attendant who told me it had no money on it. What?! Then she told me its last value had been used up at the Oakland Coliseum station. WHAT?!?! My mind was reeling with incomprehension. I just bought this ticket seconds ago; what happened to it? These days I rarely take BART but there was a period long ago I took it every day so I was hardly a newbie. I had never heard of anything like this. My theory is either the ticket machine had somebody’s old worthless ticket loaded inside it which means I won the loser lottery by “purchasing” it, or somehow I was the victim of a bold scam. Maybe someone shoved the bad ticket in the machine’s dispensing chute for an unsuspecting dupe (me) to pick up, then they came behind me and took my good card when I wasn’t looking. Perhaps it was just user error. I’ll never know. It was bizarre. I lost $5.65 and a significant chunk of my good mood. I had to go back to the machine and purchase a whole new ticket. Fortunately the wait for the train and the ride to Fremont were uneventful. At the Fremont station I easily found the stop for the 180 but it showed up quite late which irked me, further chipping away at my disposition. The 180 is an Express bus which means I could use my VTA day pass but I had to pay a $2 upgrade fare. I had plenty of time to confirm this by reading and rereading the fine print on the back of my day pass while waiting for this late bus to arrive. I boarded, flashed my pass, and dropped my last two dollar coins into the fare box. As I was turning to take a seat the driver called me back and said I had only dropped one dollar in the box. “No, I put in two dollars.” He insisted the machine had only registered one. What…the…fill-in-the-blank. I think I dropped the coins in pinched together instead of one at a time, and the machine counted them as one. This stupid machine has one flipping thing to do, count money, and it screwed it up. Fine. I pulled out my wallet and slipped a dollar bill in the machine. The driver showed me how the machine now registered $1 on its digital display, I guess trying to demonstrate its infallible accuracy. Yeah, whatever. Kiss my aggravated backside. I took a seat huffily and wondered what I had done to anger the transit gods on my return trip so. The bus rolled through Fremont onto I-680 South and before long we reached the Great Mall in Milpitas. 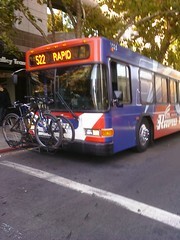 After a short wait I boarded once again the VTA 66 and rode it to the exact stop where I started my day. A two block walk back, and I was home around 7:50 PM. Eight hours on the All Camino. So what was the point? It meant a variety of things at different levels. For the purpose of this blog it was an invaluable accumulation of experience. I’ve now been on every inch of El Camino between San Jose and Daly City, except for one block in front of the South San Francisco BART station which remains a hole in my mind. I have photos, notes, and memories. I visited some cities in San Mateo County for essentially the first time, and can now put faces to the names when I write about them. I discovered new places that piqued my interest and make me want to go back. What’s most important is that I was there attentively, not thinking about driving or schedule or destination, but focused on seeing what was there. Not just living in the moment, I was living in my location, in my inertial frame. There were some intellectual accomplishments. I confirmed the paradox that this one special road contains the four cardinal directions (see sidebar). 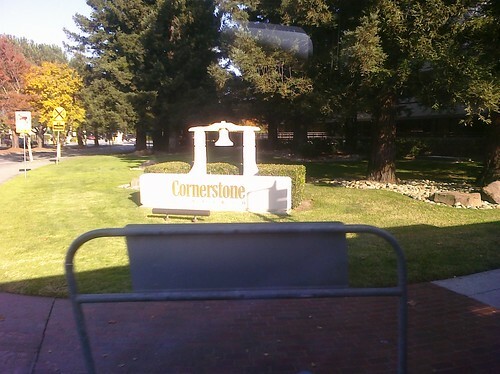 I have statistics for one side of the road, counting 25 historic El Camino Real bell markers in a single day. I tallied fast food and select other businesses; there are companies that pay for this kind of data! I don’t claim these numbers are accurate as I probably missed businesses, but some interesting trends do emerge. El Camino is a car-serving zone with plenty of gas stations (24), auto parts shops (5), and fast food drive-ins. Among the fast food spots McDonalds is surprisingly underrepresented (1) and the leader is Taco Bell (7). 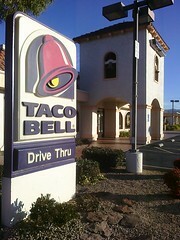 Nothing could be more fitting since Taco Bell’s logo and architecture are a commercial parody of the missions. Cars rule the road, but there are a number of bicycle shops (5) that remind us that along with the BART stations, CalTrain depots, and VTA, SamTrans, and Muni bus stops too numerous to count, real transportation alternatives do exist. This is unfinished business. I only told half of the story, the eastern half. I missed great universities, historic movie theaters, thriving shopping centers, and who knows what else. I do plan to do this same trip in reverse to observe the western half, moving counter-clockwise around the Bay. Memorial Day weekend will be the perfect time since it will have been six months from the first trip, closing the loop with elegant symmetry. I’ll admit I did get overwhelmed by this project as it took me over four months to finally get it written up. For next time I have ideas to streamline the process by writing as I go. I expect Twitter will be involved. For now, I can say: El Camino Real. Been there. Done that. Blogged all about it. You are currently browsing the All Camino blog archives for March, 2010.